View More In Vehicle Tracking and Monitoring Modules. If you own a GPS device, you will need a wireless plan to enable tracking services to work and communicate with the tracker remotely via the phone number associated with the SIM card. Some devices use text messaging to locate the tracker, others use data connection. Either way, our service offer voice call, text and nationwide 2G 3G & 4G LTE Data. Plan includes 500 Minutes or 500 Text or 500MB Data for 30 days. No activation fee. No credit check. Check Coverage map at STKMap. To activate please visit us at ActivateSpeedTalk. Nationwide service in partnership with T-mobile network, including North America (US + Canada + Mexico) roaming. NOTE: After SIM activation, it might take up to 24-hrs for the GPRS and data settings to sync and update with your device. Make sure you turned on the power in your device, in a good reception area. Enterprise, Corporate and Affiliate Accounts are available - online account management portal and API's to manage multiple SIM cards within single account and one main airtime balance. SpeedTalk offers its services through subscription plans which auto-renew every 30 days. Service begins as soon as you activate your service. You'll be charged the rate stated at the time of purchase, every month, until you cancel. There is No Contract, Cancellations can be made any time by contacting customer support. A valid credit card is required to cover overages in case you exceed the applicable Voice, SMS and Data limits. To avoid overage charges, you should purchase the appropriate plan for your anticipated needs. 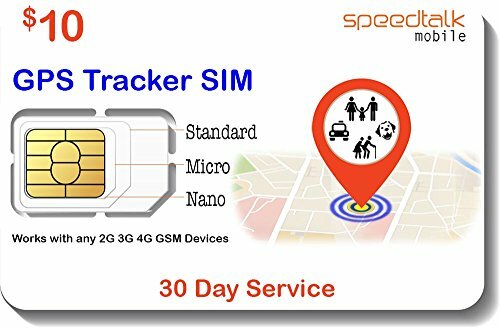 SIM & Plan is compatible with majority of 2G, 3G & 4G LTE GSM GPS Trackers and smart watches. Use 500 units any way you want in any combination of Talk/Text/Data for 30 days; Plan includes 500 Minutes or 500 Text or 500MB Data for 30 days. Punch out the 3-in-1 ready to use SIM card. Standard SIM, Micro SIM and Nano SIM. A new number is auto generated upon activation of service. If you have any questions about this product by SpeedTalk Mobile, contact us by completing and submitting the form below. If you are looking for a specif part number, please include it with your message. © 2019 - buycarnow.org. All Rights Reserved.